The World Curling Federation (WCF) has received $73,000 USD in funding from US charitable organisation ‘The Foundation for Global Sports Development’ to support both the Olympic Celebration Tour and the Sports Media Trainee Programme. 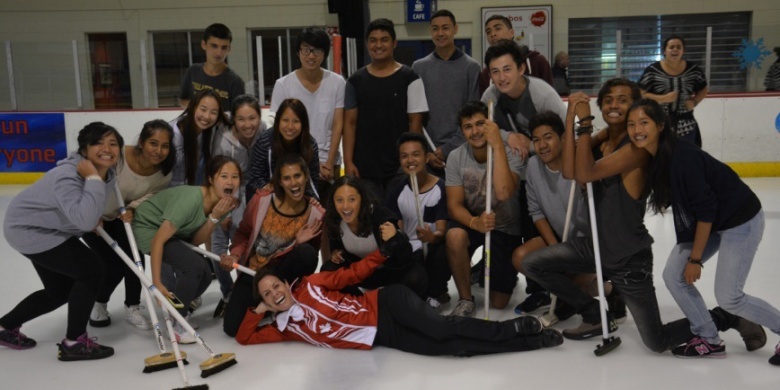 This donation will fund the WCF’s Olympic Celebration Tour for another 12 months, offering more people around the world the opportunity to take part in instructional sessions with curling Olympians and WCF instructors. The funding will also expand the Sports Media Trainee Programme which gives students the opportunity to gain practical experience at World Curling Championship events. The programme will now be offered to three student journalists and three student photographers during the 2014/15 season, giving a further two students the opportunity to work with the WCF Media & Communications team at World Curling Championships during the 2014/15 season. In addition, two TV Production Trainees will be given the opportunity to work alongside the World Curling Television crew at two WCF championships this season. A total of seven Olympic Celebration Tour stops are planned for the 2014/15 season, with the Tour resuming in autumn 2014. As part of this programme, an Olympic athlete and at least one qualified WCF Instructor will visit a WCF Member Association on a weekend to conduct a series of introductory clinics. These clinics, along with a ‘Meet & Greet’ session, will allow new and experienced curlers the opportunity to curl with and learn from an Olympian. The Sports Media Trainee Programme will be launched in September to search for trainees for Le Gruyère European Curling Championships 2014, being held in Champery, Switzerland in November. Thereafter the Programme will open again in January with a view to selecting trainees for the World Junior Curling Championships 2015 which will be held in Tallinn, Estonia in February and March, and the World Women’s Curling Championship 2015 which will be held in Sapporo, Japan in March. Working closely with international sports federations, generous donors and committed athletes, The Foundation for Global Sports Development promotes sportsmanship, education, fair play and ethics among the world's youth. The Foundation gives special emphasis to groups and communities that are most in need or most underserved by current programmes, including women, minorities and youth in areas where the risk of delinquency is particularly high. The Foundation for Global Sports Development donated $50,000 USD for the Olympic Celebration Tour and $23,000 USD for the Sports Media Trainee Programme. WCF Member Associations wishing to be host an Olympic Celebration Tour should apply through the WCF Secretariat with more information to be available on the WCF website after 15 August 2014. Contact darrell.ell@worldcurling.org for more information. The Sports Media Trainee Programme (formerly WCF Trainee Journalist and Photographer Programme) was established in 2012. It is designed to give aspiring young sports journalists, photographers and TV production students from around the world the opportunity to gain valuable media experience at international sporting events. This unique opportunity gives students the chance to develop journalistic, photography and TV production skills in a practical setting, providing them with vital knowledge and experience which will help them progress prospective careers within the media industry. For the past two seasons we opened entries to those aged between 18 and 30 years old who were in full-time education and had a passion for sport and a keen interest in writing or photography. Now, for the first time in the 2014/15 season, the WCF will also open two trainee positions to TV Production Trainees as well. 1 Trainee Journalist; 1 Trainee Photographer; 1 Trainee TV Production Assistant. 1 Trainee Journalist; 1 Trainee Photographer.